Natural gas deposit of the dissolved-in-water type, in which gas is dissolved in the formation water, is distributed in Chia prefecture in Japan. The gas deposit consists of mainly methane. Geochemical studies of gas compositions and stable carbon isotopic compositions of methane indicated the biogenic origin. But microbes and their activities in the gas field remain unclear. For estimating a potential activity of methane production we conducted radiotracer experiments of the sedimentary cores from the gas field and detected high potential activities in the sediments. Long-term (tracer-free) incubation experiments showed that intense methane production occurred in the core samples. The results indicated the potential of subsurface microbes to metabolize a substantial fraction of fossil, recalcitrant sedimentary organic matter, i.e. kerogen, for methanogenesis. Reference: Yoshioka H, Mochimaru H, Sakata S. Takeda H, Yoshida S. (2015) Chemical Geology 419, 92-101. Methane in marine methane hydrates, attracting people’s attention as future energy resources, is mainly microbial in origin. It is unclear, however, where in the subsurface this methane production is active and what controls the activity. 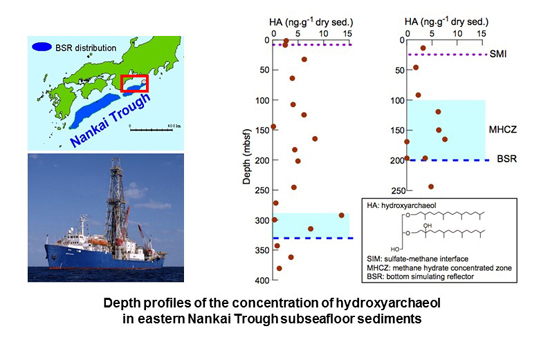 To address these questions, we have conducted research as part of MH21 to measure polar archaeal lipids in sediment core samples collected by deep-hole drilling in eastern Nankai Trough. As a result, archaeol and hydroxyarchaeols were detected in most of the samples, and their carbon isotopic composition relative to methane showed that they were biomarkers derivation from methanogens. We further found that the concentration of each hydroxyarchaeol was correlated with the total organic carbon content, which suggests that the concentration of bulk organic matter is a primary factor controlling the distribution of methanogens in the sediments. Reference: Oba M., Sakata S., Fujii T. (2015) Organic Geochemistry 78, 153-160. 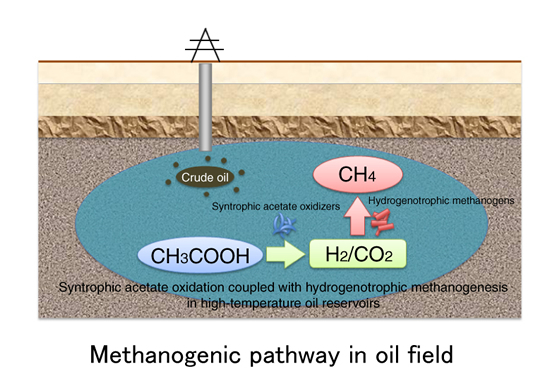 In order to elucidate oil degradation and methanogenic pathways by microbes in oil reservoir, we charged high pressure vessels with production water and crude oil from a depleted oil field in Yabase, Akita Prefecture, which were incubated under high temperature and pressure conditions simulating subsurface environment. As the incubation proceeded, we found that methane was produced with equivalent amount of acetate degradation, and that carbonate reduction was the major methanogenic pathway. We further discovered from the result of gene analyses that acetate-degrading bacteria and hydrogenotrophic methanogens became dominant, indicating that methane was produced from syntrophic degradation of acetate, an intermediate product of oil degradation. Our findings suggest that stimulation of microbes in oil reservoir enables efficient conversion of crude oil to methane. Reference: Mayumi et al., (2011) Environmental Microbiology 13(8), 1995-2006. We participated IODP expedition 311 and researched distribution of methane hydrate and subseafloor microbes in the sediments in the Cascadia Margin. Results of DNA analysis showed that functional gene of methanogen was detected in the hydrate-bearing sediments. We conducted tracer experiments and observed relatively high methanogenesis activity in the hydrate-bearing sediments comparing with those in the sediments at other depths. These results may imply that in-situ methanogenesis activity in the hydrate contributed to forming of methane hydrate. Reference:Yoshioka et al., (2010) Geobiology 8, 223-233. ANME plays an important role in anaerobic oxidation of methane (AOM) in marine sediments. In contrast, little has been known about AOM in the terrestrial subsurface environments. By using a 13CH4 tracer, we detected a potential activity of AOM in the Holocene sediments of < 20 m deep in the Kanto Plain, Japan. The 16S rRNA sequence analysis based on RNA clearly revealed the presence of a distinct subgroup of ANME-1, designated ANME-1a-FW. Higher AOM activity was observed in low-salinity treatment compared with high-salinity condition (20‰). This is clearly different from the response of the previously known ANME in marine environments. 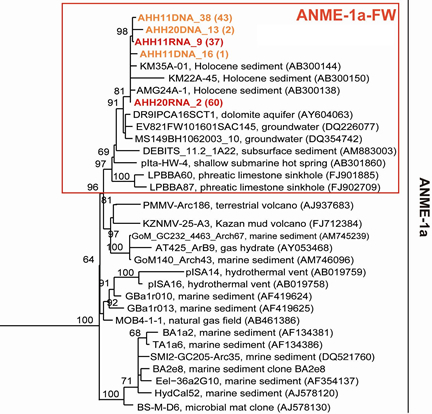 Our results suggest that ANME-1a-FW represents a subgroup of ANME-1 adapted to freshwater habitats and play an important role in the carbon cycle in terrestrial freshwater subsurface environments. Reference:Takeuchi et al. (2011) Environmental Microbiology 13(12), 3206-3218. Contaminated aquitards is a major concern in subsurface contamination. Once chlorinated ethenes have penetrated an aquitard, they migrate slowly, and serve as a long-term contamination source to the adjacent aquifer. However, most of the available treatment techniques designed for aquifer are not effective for contaminated aquitards. We examined a possibility of natural attenuation in contaminated aquitards. 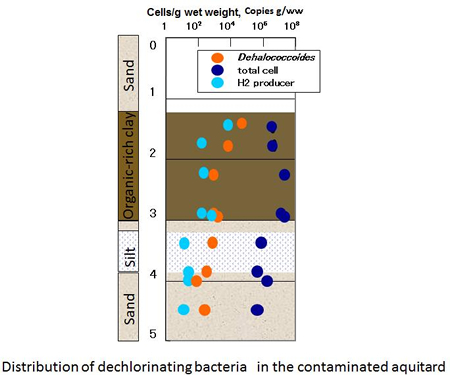 Despite their low permeabilities and small pore spaces, dechlorinating microbial communities, such as Dehalococcoides and H2-producing bacteria were active and dechlorinating tetrachloroethylene in the contaminated aquitards, especially in the organic-rich clay layer. The organic-rich clay layer was also considered to play an important role in the natural attenuation process in the adjacent aquifer, possibly by supplying carbon sources or electron donors. Reference:Takeuchi et al. (2011) Journal of Contaminant Hydrology 124, 14-24.